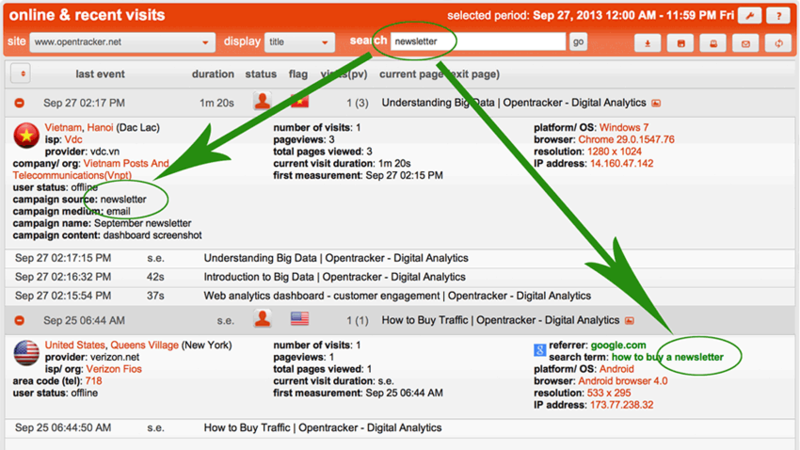 The beauty of simplicity: Search through all your website traffic and visitor data in real-time. A universal search bar that gives you access all areas – search at it’s most intelligent and efficient. Enter any search term that interests you and get immediate results based on all your site content and complete visitor history. Enter any word, strategic term, page title, url, product, search term, ip address, user-name, company, email, OS, device, etc. If you can think of it, you can search for it. For example, do you need to be able to see the complete history of any user, visitor, or registered member of your site? Enter a city or region name, to search for visits from the a that city or region. Enter a (partial) URL to find visits that have looked at that page or pages. wildcard (*) search will match anything. An example of universal search; locate everyone who landed on the pay page. In the screenshot above, we have used “pay*” to locate recent conversions for a PDFmyURL website-to-PDF service.